Goa’s horizons are red. A pale pinkish red, the bright saffron of the Indian flag, and the the deep, rust color of dried blood. It exposes itself up and down the coast; jutting out from the sea in pinnacles at the beach heads and scarred into the dry grassy hillsides dotted with coconut trees. 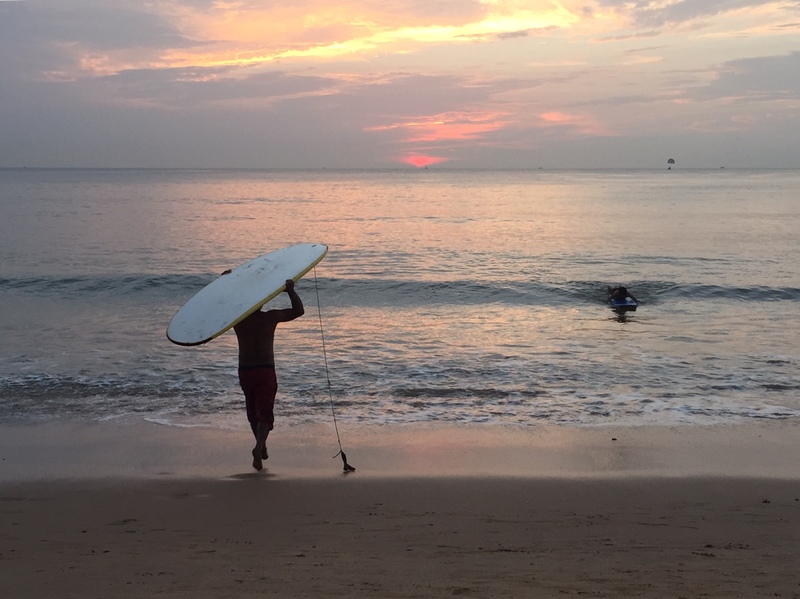 It covers your body before your next dip in the cool Arabian sea and shades the sky before the evening’s trance party blurs the transition between night and day. The land’s abrasive rust subsoil is the building blocks of its society. Its crushed to make the roadways and locals toil with crude hand-tools to chip away rectangular red bricks. Across the countryside neat stacks of these earthen building blocks mark the transition from fiber huts to solid walls. Along the fields and roadsides they are laid one atop the next to make the houses then doused in plaster and painted in aquamarine, lime green, tangerine, and plum; the bright bold abodes so common across the tropics where life seems more colorful and houses are designed to compliment verdant flowers and succulent fruits. 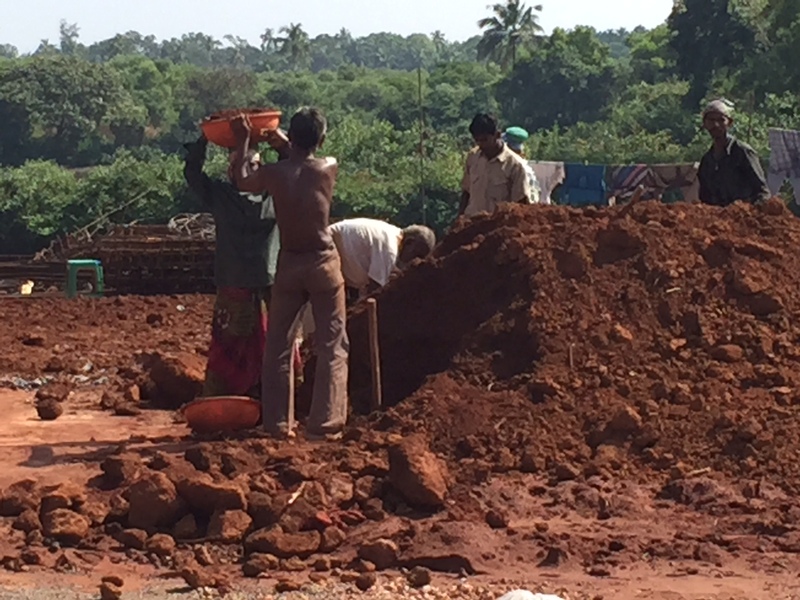 Road Construction in Goa…one bowl at a time. 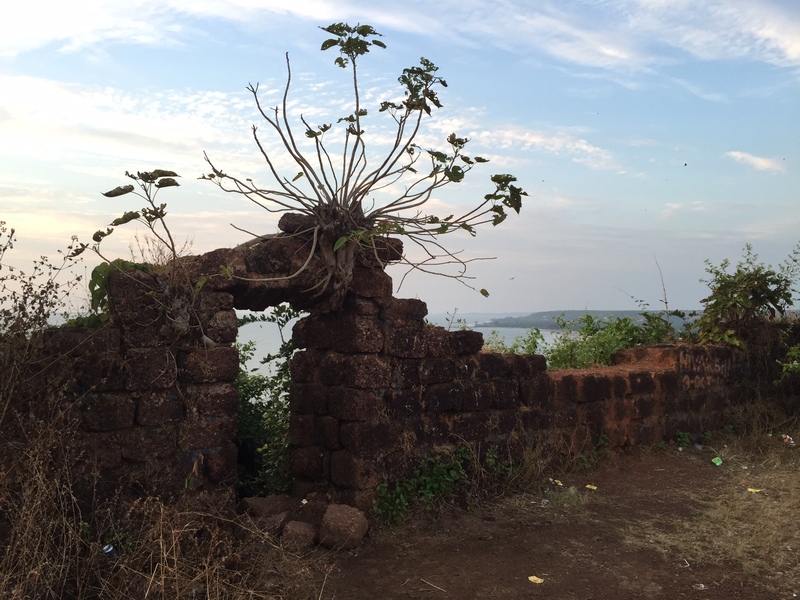 In the time before Goa’s beach restaurants and colorful abodes, the deep crimson stone also provided the building blocks for a robust colonial society here. 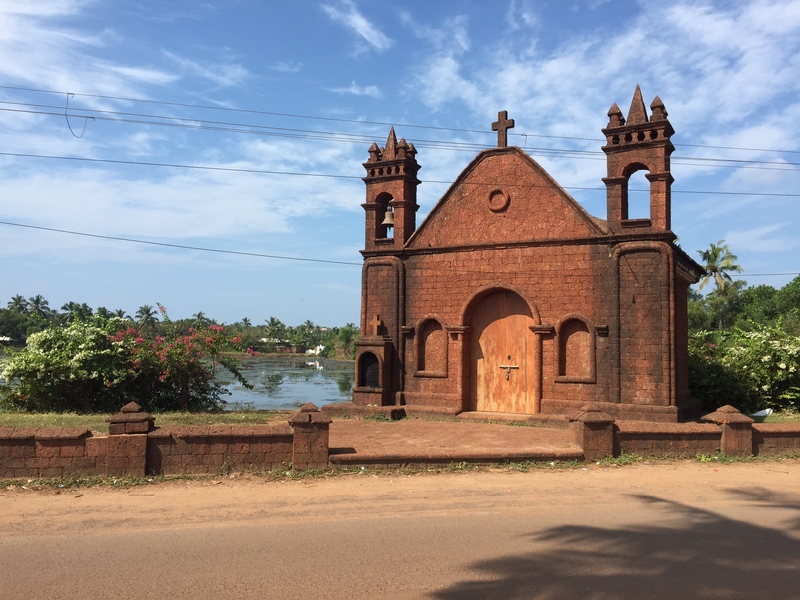 The Portuguese used them to crown the costal hillsides with fortifications protecting their inland trading capital, today called Old Goa, which at its peak was populated by half a million merchants from across the world. Now the aging forts, crumbling and overgrown are home only to basking lizards, raptors and multi-colored bee-eaters. They also provide optimal views of the boundless landscapes and hazy rose sunsets that christen the coast. Centuries after the Portuguese retreat the Goan coast saw a second invasion of foreigners who left their homeland with a reputation as being nearly as rebellious and rough around the edges as the fifteenth century sailors who preceded them; hippies. The long sand beaches and cheap, easy living far removed from the strictures of cold war Europe attracted an exodus of flower-haired, dread-heads, artists, freaks, and hapless wanderers from the infamous hippy trail of the mid 70’s. This wayward’s trail led the continent’s counterculture east through Turkey, Iran, Afghanistan, Pakistan, India, and Nepal. 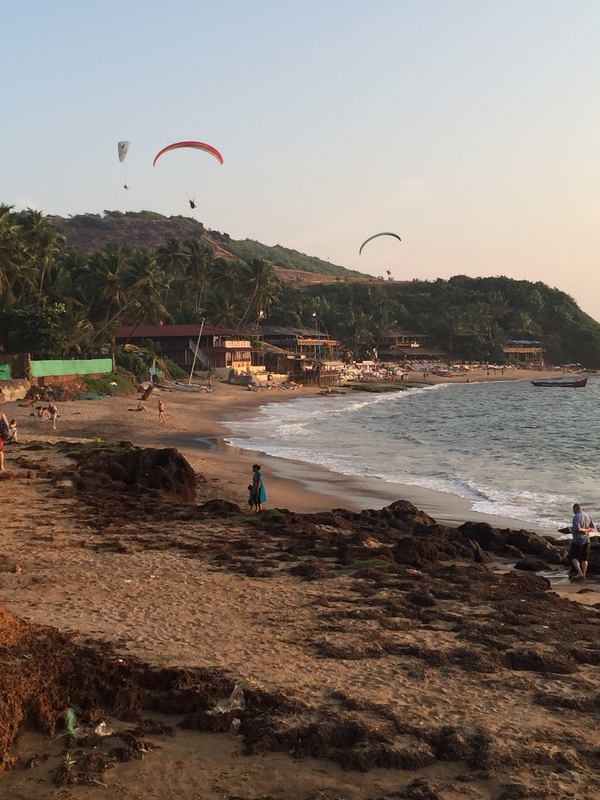 They formed a particularly populous community around Goa’s Anjuna and many remain today. Inevitably, with many Westerners settling and many more flocking for shorter intermittent sojourns, Anjuna’s character has been gradually transformed. The communal feel faded as hotels, restaurants, bars and shops sprang up. By the mid 90’s, the acoustic guitars of the hippy forefathers had begun to be drowned in the drum and bass of a thriving, world renowned Rave/Trance scene. Though the all-night raves (on the beach at least) have quieted slightly as Goa tries to put on a more polished, upscale image for domestic package tourists and the large swathes of Russians who have made Goa their tropical destination of choice, the Anjuna area remains a focal point for alternative lifestyles and attracts one of the most eclectic mixes of travelers we’ve encountered. Alongside the partiers, Goa has also established itself as a center for yoga, which is what beckoned us to its beachside. Though each seek transcendence of sort, the difference between the two lifestyles is apparent when they intersect. Early dawn we’d be wiping the sleep from our eyes and strolling yoga mat in hand to our shala of choice to begin the day with Ashtanga practice while rickshaws sped past taking starry-eyed trancers home until dusk’s fading light called them back to the intoxicating beat of the international trance scene assembling on the beach. Goa is home to many accomplished yoga instructors one Iyengar instructor commented that there were more teachers here than students. We were exceedingly fortunate enough to study under one of the area’s most accomplished, in fact one of the preeminent ashtanga instructors in the world. Rolf Naujokat, a thin German man with long, greying hair pulled back into a bun framing a bearded kind smile, and large dark, sunken eyes dominating his weathered face and radiating serenity personifies Anjuna’s more spiritual, enlightenment-seeking side. He came to India via the aforementioned hippy trail in 1975 and found his calling as a yogi living with Sadhus on the banks of the Ganges. He then made his way south to Mysore where he studied for 16 years under the father of Ashtanga Yoga, Sri K. Pattabhi Jois, before establishing his own shala in Anjuna. Along with his American wife Marci, he now spends his mornings with a mug of chai in hand, adjusting yogis from around the globe and offering instruction in a soft steady voice. His evening takes him hiking trailed by his eight dogs and devoted students up a quiet hillside to watch the crimson sun set over the serene sea below. He is a forefather to Goa and seemingly intends to savor its every sanguine moment. Ending yoga early each morning, topped off with Artjuna cafe’s healthy middle-eastern breakfast washed down by fresh fruit-juice and locally roasted espresso, meant that we had lots of free time to spend at Goa’s primary attraction; its many beaches. From small isolated coves to long golden threads curving into the dusty horizon, there are countless choices of where to spread out your towel, each having its own unique feel. Nearly all of them have small beachfront restaurants with lounge chairs and umbrellas so that for the price of a juice or soda you can have a little shade and comfort along with a place to leave your things while swimming (we discovered many restaurants at Arambol beach charge 50 RP per chair for the day). The best way to find your ideal beach is to get a motorbike and explore the Coast. After all, the journey whizzing through the picturesque countryside is often as enjoyable as the beaches themselves. Scooters are inexpensive (between 250-500 Rp/day) and the beaches are connected with paved, well-marked roads while Goa’s relatively small size means you can cover much of the coast in a very short time. 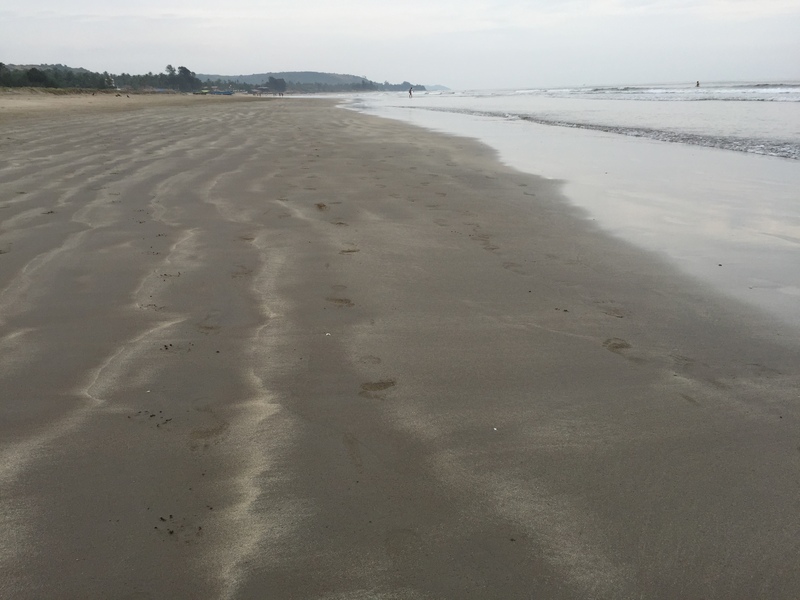 Our favorite strip of sand was Morjim Beach. Located 20 minutes north of Anjuna at the mouth of the Chapora River, the long beach is rock free and descends gradually into the sea. Our fondness of it had much to do with the fact that it was one of the quietest beaches we found and had excellent swimming. Though there were restaurants for drinks and snacks, Morjim was delightfully free of hawkers, beggars, and thumping bass. 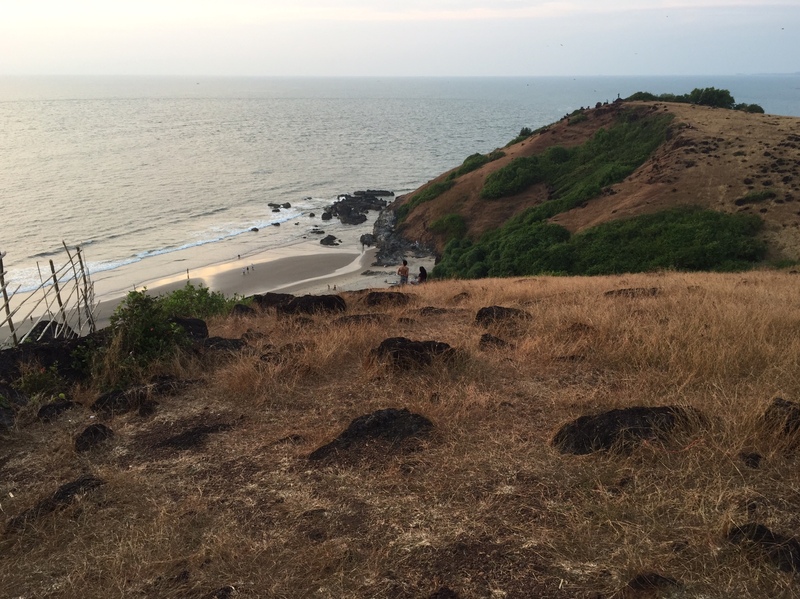 It’s also a nesting site of the endangered Olive Ridley sea turtle. 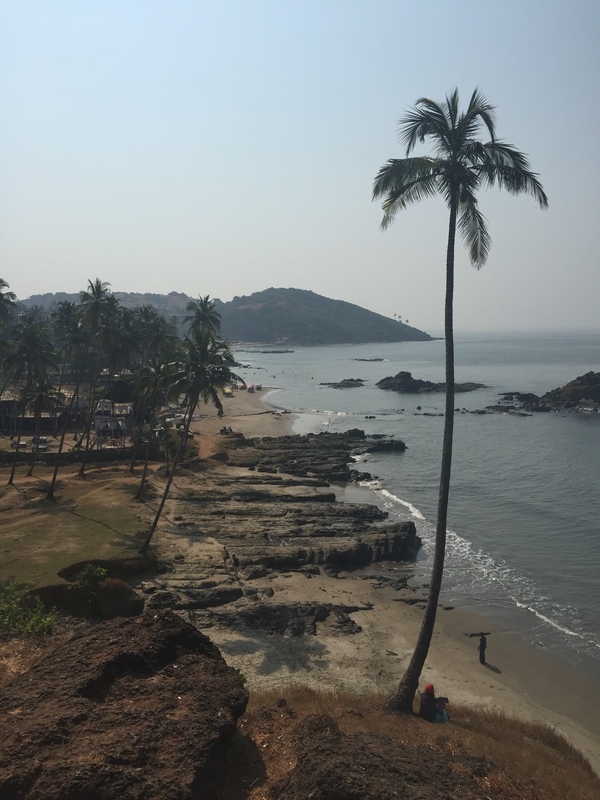 Anywhere on Goa’s coast will provide a respite from the chaos typical of India in spite of the fact it is not entirely serene. A motley scene is now the essence of Goa, and although you will always find yourself in great company it is no longer a place of utter tranquil retreat. 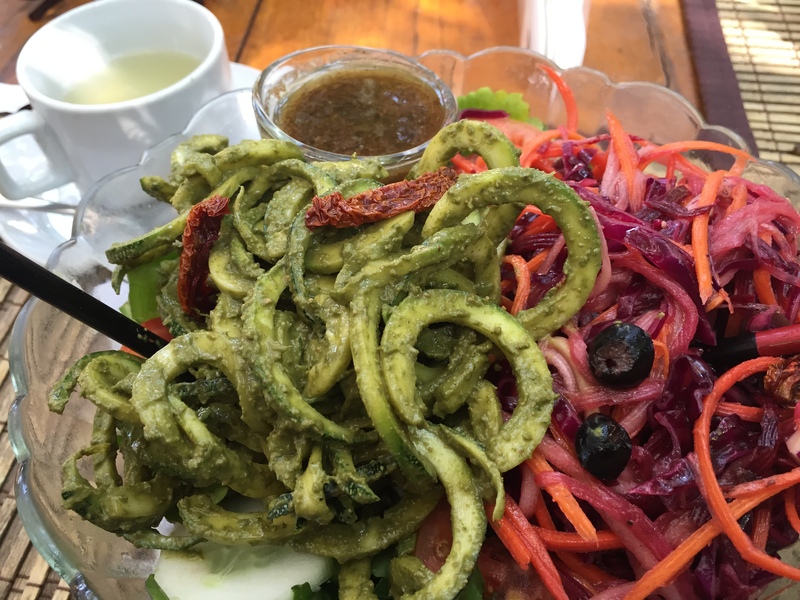 Notwithstanding, the way of life remains slow, the food tasty, and it continues to be a place where anyone can find their niche if they look hard enough.